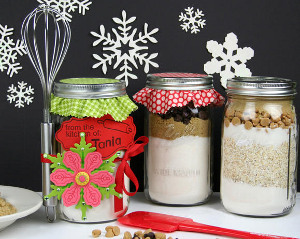 This Cookie Mix in a Jar craft is the perfect easy homemade Christmas gift idea. 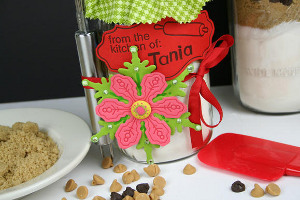 Personalize the outside of the mason jar with fun designs and sequined stickers. 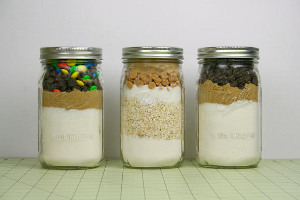 Then, fill the jar with all the dry ingredients needed for your cookie recipe, making sure to layer it neatly in the jar so you can see the variety of ingredients. Make sure to write out and attach the recipe so your recipient can properly bake your yummy treat! To add some fun flair to your jars for gift giving, trace the outer ring of the smallest circle in the Supersized Circle Template set onto the backside of a coordinating piece of fabric. 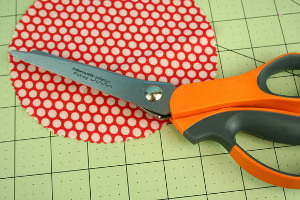 Cut out along your traced line using pinking shears. Place fabric over seal, and then tighten ring over the fabric. Use glue dots to attach a whisk, spatula or wooden spoon to the side of your jar, and then tie a 20” length of grosgrain or satin ribbon around the jar. Here’s a TIP: For extra support you might want to secure the utensil with a rubber band. Just make sure your ribbon hides the rubber band. Set aside as you craft the pieces to embellish the jars. Create labels for the front of your jar using your Fuse Creativity System along with Medium Design Set 0111 and Medium Design Set 0191. 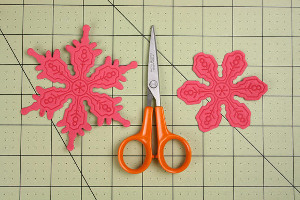 Create two snowflakes from Medium Design Set 0111 using two different colors of cardstock. A darker ink of the same color cardstock gives depth to your piece. Decide which of the two colors will be the top layer and cut around the inked image as shown. Personalize the ‘from the kitchen of:’ label using letters from the Alpha Basic stamp set mounted to your stamp block. 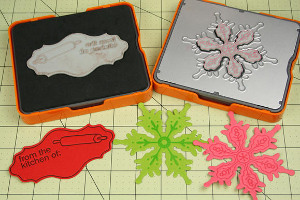 Layer both snowflake die-cuts one top of one another, matching the centers. Use a paper piercing tool (or a thumbtack) to poke a hole through the centers. Insert fabric covered brad through the holes and open the prongs on the back. 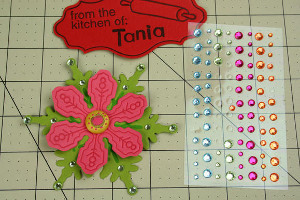 Further embellish the larger snowflake with self-adhesive rhinestones placed over the letter pressed dots at the tip of each point on the snowflake. Use glue dots or foam tape to attach the label and snowflake to the jar. You may have to adjust your ribbon/bow to be off to the side so your die-cuts will lie nicely. I found it easier to make the layered snowflakes slightly off-center to the left of the personalization stamped on the kitchen label so the name shows completely. Be sure when you gift your cookie mix you also include instructions for mixing and baking so the recipient can prepare their cookies. *NOTE: For M&M cookies, reduce salt to ½ tsp. and substitute M&Ms for chocolate chips. Or, do half chocolate chips, half M&Ms. Add ingredients to jar in order listed. Pack each layer firmly. Mixing instructions to include: Preheat oven to 375 degrees. Empty jar of mix into large bowl and mix evenly to distribute ingredients. Add ½ cup softened butter or margarine, 1 egg (slightly beaten) and 1 tsp. vanilla. Mix well. Place by spoonful, 2” apart onto ungreased cookie sheet. Bake at 375 until edges are light brown—approximately 11 – 13 minutes. Yield 2 ½ dozen. Add ingredients to jar in order listed. Pack each layer firmly. Mixing instructions to include: Preheat oven to 350 degrees. 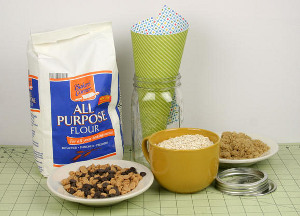 Empty jar of mix into large bowl and mix evenly to distribute ingredients. Add ¾ cup softened butter or margarine, 1 egg (slightly beaten) and 1 tsp. vanilla. Mix well. Place by spoonful, 2” apart onto ungreased cookie sheet. Bake at 350 until edges are light brown—approximately 10 – 12 minutes. Yield 3 dozen. Omg! I don't know why I've never thought of doing this on any holiday season before. 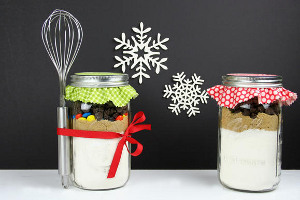 This prepacked cookie mix will cut out your baking escapades in half. It's a great planning and organising trick I'll be sharing with my baking friends.